Owen's Donald Duck shirt...it turned out better than I thought it would. I have a feeling I'm going to say that about all the shirts. I guess I have low expectations of myself! As for price...I found this shirt in Owen's closet, the white for letters was from the lining of the green shirt I used for Jack's Buzz shirt and I got the Donald Duck applique for 50% off at Joann's. Total cost $2.50! Ella's shirt was a struggle. I just wasn't sure how I was going to do the bow for Minnie Mouse and then I saw online someone did an actually bow with ribbon. I loved it! So I gave it a go. This is my new favorite shirt. I love all the shirts, but this one seriously looks like I could sell it online! Ella of course was beside herself when she saw it. Price for Ella's was just the shirt at Wal-Mart which was $3.48. The striped fabric was a shirt I didn't like anymore and the ribbon I had on hand. The Monday prior to my gum graph....hence the blogging hiatus...we had our last day of home school at Miss Kim's house. I'm planning on doing a couple days a week with Owen and Jack at the house just to keep things fresh in their minds. It's so crazy to think back to Kim and I talking about home schooling our kids together (at the time it felt like it was forever away) and now we've finished our second year! Time has a way of doing that doesn't it? Since the first day of school Owen has learned so much! He knows how to write every letter both upper and lower case. He can read many words....he doesn't know all the rules yet, but I'm sure he'll get that next year. He knows all the months of the year, can count to 100 by 1's, by 5's and by 10's. He can also count to twenty in Spanish. He also knows the different values of money when it comes to pennies, nickels and dimes. This cute kid can't look at the camera to save himself! Jack has also come a long way this year. He can write his full name....he practices and practices this one. He can cut and paste really well now. This was such a struggle for him last year. Jack is an excellent at coloring. He loves to pick all the different colors so the picture really does look true to life. He's usually the last one coloring because of this. He can count to around 39, but he does know the song counting by 5's and 10's to 100. Not only is it neat to see the change in the boys looks in this picture you can see how much Andrew grew since last October. Andrew also learned how to spell his name and count by 5's and 10's and in Spanish. Andrew is very precise when it comes to doing things...like lining up his coins. he likes them to be in a nice straight line! Ella and Josiah didn't get their pictures taken yet since they aren't technically in school this year. Next year they will start their first year of preschool! Scary!!! The best part of homeschooling for me has been speaking the Word of God into these kids lives. When we meet at Miss Kim's we read a Bible story from The Jesus Storybook Bible and then we sing a Bible verse that goes along with the story from our Seeds of Family Worship CD's. We talk with the kids a lot about the stories and how they match up with how we live today. We've also explained to them that they don't allow this in public schools today. I feel so strongly that I need to be the one teaching my children these Godly principles and pouring into their little impressionable minds the Word of God. Zeke's party was on Sunday and it turned out to be a beautiful day for a party! His theme was Little Red Wagons. I happened to have this wagon picture frame and then I found the other wagon at a garage sale for a buck. The other little wagons are made out of paper using my Big Shot from Stampin' Up. They are actually the matchbox die just without the cover. I added the paper wheels and then a cute handle. Each wagon has 4 Hershey Nuggets in them. To go along with the theme I used my Top Note die and made more wagons and hung up a picture banner with pictures of Zeke from Newborn - 12 months. Here's birthday boy himself! He was actually fashionable late to his own party since naptime didn't go as planned. Papa & Grandma Martin came to the party for a little while...it was nice to see them! Uncle Jon and Aunt Becky came to the party with Camryn and Samantha in their new to them big red truck! Pa and Bill had a great time chatting! Since it was such a nice day we brought out both kid picnic tables and let the kids eat outside....yay for clean floors!!! Little man ate inside at his highchair. He was quite focus too...we actually had to stop him from eating so we could move on with the par-tee!! Don't mind the stupid look on my face...what amazes me about this picture is the fact that Zeke is like whatever. He's surrounded by loud children and a bunch of brightly colored bags and he doesn't have a care in the world. He's awesome! Papa and Grandma Martin got him his very own Jake and the Neverland Pirates beach towel and these cool chunky cars. Zeke loves driving these around! Ga-Ga and Pa got him swim trunks and a cute onesie/short-all outfit. The card they got him is Elmo and it talks when you push a button. Zeke loved it so much he kissed Elmo! Jack was so cute he wrapped up three toys from around the house for Zeke...this ball was one of them. This picture shows the two things he loved the most that night...Elmo card and a ball. The last present deserved to be climbed on...it's a push walker from Uncle Ry and Aunt Becky. The other presents Zeke got were - more clothes, music player, books, Veggie Tales movie, sippy cups, glow worm and a gift card to Toys R Us. When it came time for cake I nearly had a heart attack. Ella had asked me if it was cake time and I said yes. Well she took it upon herself to help out and she went and grabbed the cake off the counter. Thankfully it was still in the packaging from Costco so it basically just flipped over and landed in the plastic lid. It didn't look pretty, but it still tasted great! Love the look on his face...he wanted that candle! On Saturday we had pictures taken at JCPenny's and we gave Zeke a cupcake there and he wasn't very interested at all so I wasn't sure what he was going to do with his smash cake. I bet more fingers is better! Should it go up here too? A couple days before Zeke's party I decided I didn't like the onesie I had previously made for his party. I decided to go with the red wagon theme and make him a red wagon with a 1 in it. Thank you to everyone who came out and celebrated our baby boy with us! This time last year I was walking around Swedish Medical Center in quite a bit of pain. Trying to see if my contractions would pick up speed or if my body would make a noticeable change so the doctors could actually have grounds for performing my C-Section prior to my 39th week. Thank goodness the doctor decided that the intensity of my contractions was enough and we got to get the show on the road. I was so ready to meet my baby. I remember laying on the operation table waiting to hear Michael say, "It's a...." and in my heart knowing he was going to tell me it's a boy! Zeke Russell Martin! My last baby! Zeke you are such a joy! So full of laughter and smiles. You are such a mischievous little guy already...we are so going to have our hands full with you! You have completed our family on all sides....our last baby, the last grandchild on Daddy's side of the family and the last on Mommy's side of the family. Perfection if you ask me! After my mom got the playset I knew that I wanted to get a swing for Zeke...not one of those plastic ones though. I wanted a nice bucket seat like you find at parks. I found them online for around $50. Like I said in my previous post we are doing the whole Dave Ramsey FPU thing so I couldn't just go out and buy it since I didn't have $50 set aside for a swing. So I came up with a plan! Since Zeke is our last baby I am at that wonderful phase where I can get rid of all that terribly huge baby gear! YAY!!! So I took in the Exersauser, Johnny Jump Up, Slide/Swing climber, Dinosaur Ball Toy and a couple other small things to a local consignment shop and I got $56 for all of it! It's so great that Zeke can now enjoy the swing set with the bigger kids. Not sure if he's happy? Get a closer look! Oh yeah he's lovin' it! He even loves it when his older siblings swing him! Ella says, "Underdog!" and then basically runs under the swing...it's the cutest thing! "Hey...why isn't anyone swinging me?" The Choices We Make - Finances! 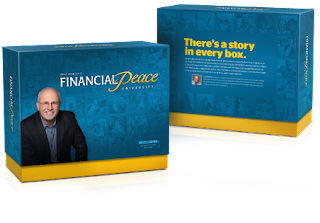 Back in April Michael and I started taking Financial Peace University at our church. I was really excited to start it and I have not been disappointed. It's definitely a different way to think and live, but I do honestly feel at peace with our money. Not that I was super worried about it before, but now I feel more in control of our money and where it goes. It's also nice to know that we have money specifically set aside for emergency and then every month we are telling all our money where it goes. The biggest change has been no longer using credit. We aren't canceling our accounts, but I cut up my cards. Michael still has his, but he never uses them. It's not like we were in credit card debt, but it was easy to use and then just pay off. Now I'm having to be more mindful of whether or not we actually have the money and do we have money for that specific purpose. We are doing the envelope system so we are using cash for most things and it's definitely a different way of thinking. It is WAY harder to hand over cash than it is to swipe a card! Also we are budgeting and saving for things now instead of just running out and buying them. For example I really want some shoe cubbies for our entryway closet...normally I would go out and buy them using the credit card and be done with it. Now we are just setting aside some money each month and in two months we'll just go into Lowe's and buy them with cash. It definitely takes some patience! Have any of you taken FPU? What are your thoughts on it? Do you still follow the principles? In the last few weeks Owen has really grown...not in stature, but in abilities! He's getting stronger and most able to move heavier and odd things on his own. It's so fun seeing him do this and it's quite helpful for me! He has such sense of humor and he is quick witted. Also nothing gets past him! He can swing himself and he's pretty stoked about it as you can see from his face! At the dentist his independence really comes out! Once I took this picture he said, "Mom can you get out of here now?" Seriously he said that! Sheesh! Since he's a bigger boy he got to have xrays taken with the stand up machine that goes around his head. He also got to use the fluoride trays instead of the yucky paint that they use when you're younger! My boy is getting bigger! The Choices We Make - Cleaning!